The union wage premium also differs between public sector and private sector employees. 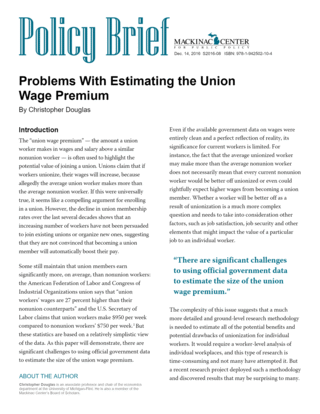 As previous research has found, my analysis identifies that the union wage premium tends to be higher for private sector employees compared to public sector employees. The premiums in these two cross sections also vary in how they’ve changed over time. The union wage premium for public sector employees did not changed a great deal between 1985 and 2014. 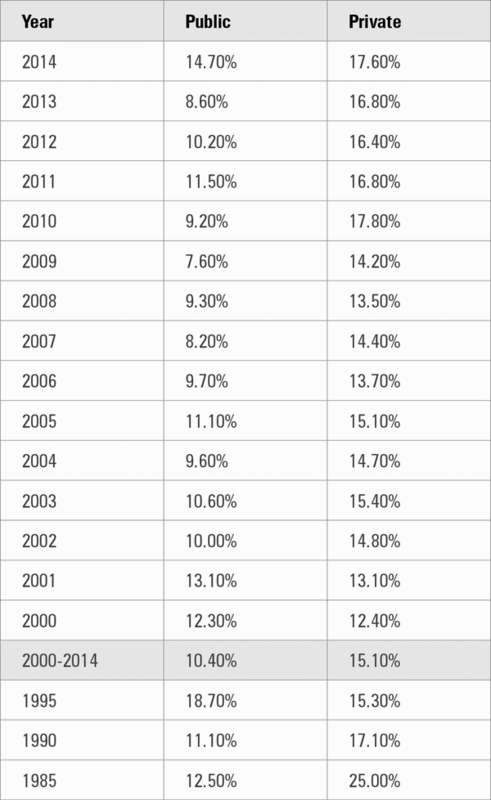 It actually grew from 11.5 percent in 1985 to 14.7 percent in 2014, an 18-percent increase. For most of the last 15 years, the premium was below the 1985 mark, but it jumped significantly from 2013 to 2014, going from 8.6 percent to 14.7 percent in just one year. The lowest recorded public sector premium found in this analysis was 7.6 percent in 2009. This growth in the public sector union wage premium diverges from the general trend of a steadily decreasing union wage premium found in the overall average and in specific industries. One potential contributing factor to this abnormal trend is the fact that the education and health care sector is made up of more public sector employees than most other sectors. And recall that this was the only sector out of the seven analyzed that saw the union wage premium grow from 1985 to 2014. The union wage premium in the private sector, on the other hand, follows the general trend and decreased from 1985 to 2014. In the private sector, the union wage premium was 25.0 percent in 1985 but 17.6 percent in 2014, a decrease of 30 percent. It has grown slightly over the last several years, increasing from 13.5 percent in 2008. In this analysis, the lowest recorded private sector union wage premium was 12.4 percent in 2000. U.S. Census Bureau Current Population Survey. All figures are statistically significant to the 0.05 level.